What is this? A course of cognitive activities to help with short term memory worries. How much? The cost is £60.00 for the course. I am interested – please contact Sarah Rodgers on 01903 896883/240313 sarah.rodgers@abbeyfieldferring.org.uk or pop in to the office for a chat. 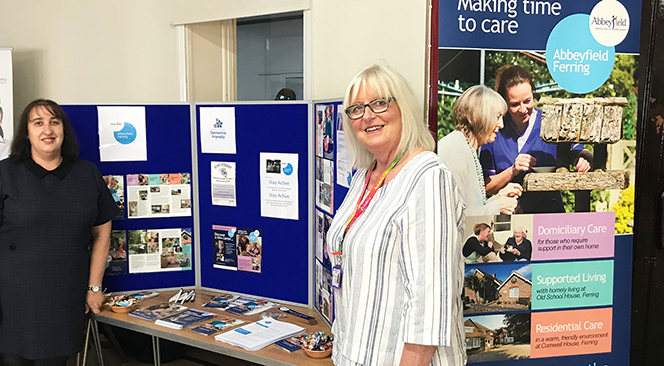 While the weather was beautiful, carers and residents enjoyed the sunshine and a cream tea which was laid on by a relative in appreciation of the care given to her late mother by carers of Cornwell House, the Abbeyfield Ferring home. The cream tea was enjoyed by carers and residents alike on a sunny spring day in the home’s delightful gardens at Cornwell House, a residential care home in Ferring, near Worthing, West Sussex. Towards the end of 2017, our offices were noticeably becoming too small for the number of staff needed to run the charity’s services effectively. The Society’s board decided to look for new offices for Abbeyfield Ferring that could incorporate space for a small day centre/community hub to extend support and information for Ferring residents. The board were extremely fortunate to find space in the heart of the village adjacent the Kingsley café. Building work, to renovate the property, is now complete in readiness to launch new community services. The staff will move out of their current offices at 30 Ferring Street in the spring. The additional new space will be available for day respite services for people living with dementia; intergenerational workshops to combat loneliness and isolation; a Stay Steady exercise group twice weekly as part of a falls prevention programme; a K9 companion service to allow people who cannot keep pets, to enjoy the therapeutic benefits of companionship through walking petting dogs; a tea and chat group, an advice drop-in and equipment hire and purchase service. The services will be a mix of fee paid and subsidised services. More details will be announced as the services are launched in the spring.